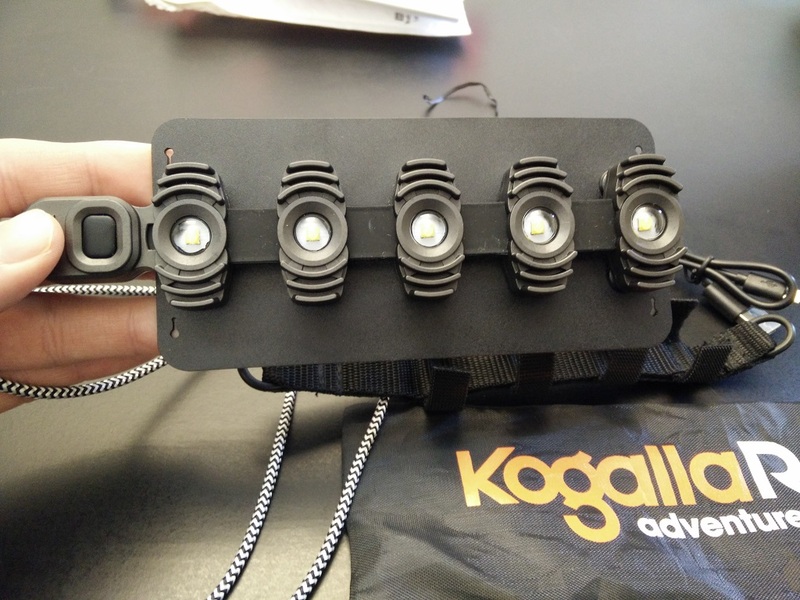 A couple of weeks ago, I received the Kogalla RA Adventure Light and since then I’ve been regularly testing it on my hikes, while running and in everyday life. 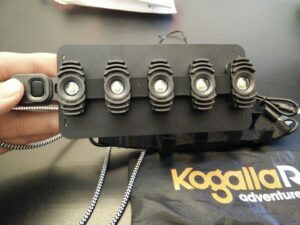 The Kogalla RA light is supposed to be an alternative for a headlamp/flashlight or as the Kogalla team describes it, “a radical new approach to portable lighting”. 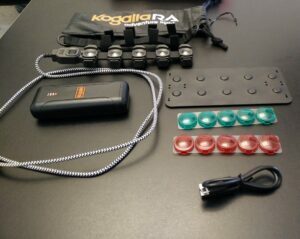 The Kogalla RA package includes the RA portable light, battery pack, a mini USB cable for the battery pack, a magnetic panel, strap attachment system and red/green light filters. The magnetic panel allows you to attach the light in multiple ways. 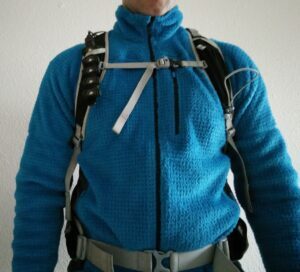 You can for example place the magnetic panel under your clothing (fleece jacket, rain jacket etc.) and the light over your clothing. Hereby the magnetic panel will attach to the light and thus keep it in place (at least in theory). The included strap attachment system is intended for attaching the light to your gear such as a backpack etc. I must say that I was at first a bit sceptic about this new approach to portable lighting, but I decided to give it a try, nevertheless. Here is what I learned about the Kogalla RA Adventre Light. 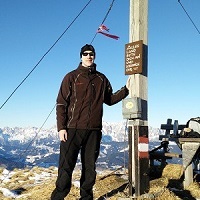 Note: I tested the Kogalla RA Adventure Light as a hiker/runner – it might be more or less appropriate for other sports. The Kogalla RA light is equipped with five LEDs which together cast up to 800 lumens. The beam distance is shorter than for headlamps with similar brightness, but the Kogalla RA does disperse light in a 120-degree pattern and thus illuminates the surroundings very well. The wide beam is necessary because the Kogalla RA does not move with your head like a headlamp – if the beam would be narrower you would have to rotate your torso all the time to light up the surroundings. All in all, the Kogalla RA light provides great illumination. However, because it does not move with your head it is not the best option for climbing, mountaineering and similar activities. You switch the light on by pressing the rubber button on the side. The Kogalla Ra supports two different modes as well as strobe lightning. You cycle through the modes by pressing the rubber button right after you switched the light on. You switch the light off by waiting for a couple of seconds and then pressing the rubber button. You can adjust the brightness for all modes by selecting a mode and holding the rubber button down until you reach the right brightness. The Kogalla RA light also has memory; when you switch it on, it is in the same mode as it was when you switched it off. The rubber button is quite big and thus you can easily press it even if you are wearing gloves. All things considered, the light is very easy to adjust and use. I must say that, however you put it, attaching the light is a hassle. Occasionally, the magnetic panel does not want to stick to the light without any particular reason. When it does attach to the light, it does, however, hold it firmly in place. 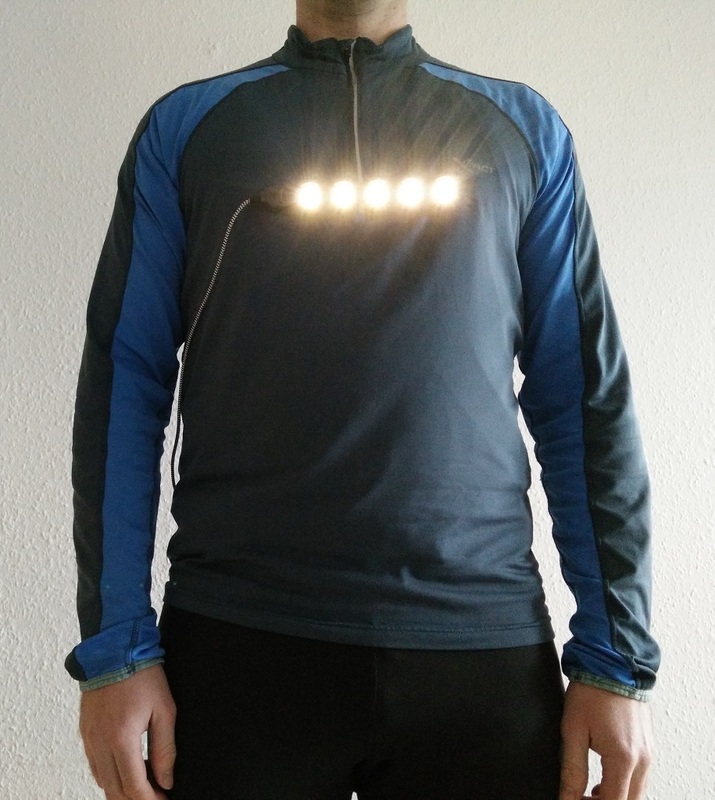 I was surprised how good the magnetic panel holds the light in combination with a lightweight fleece jacket – the light did not move for an inch while I was running. However, forget using the magnetic panel on thicker clothes (such as an insulated winter jacket) because the magnet is simply not strong enough to attach to the light through such clothes. You also cannot use the light and the magnetic panel with summer clothes such as a t-shirt because the magnetic panel will rub against your bare skin. You should therefore be wearing at least two layers when attaching the Kogalla RA; a base layer for protecting your skin against rubbing from the magnetic plate and another layer which is thin enough for the magnetism to work. Therefore, the light is kind of season-specific – at least in combination with the magnetic panel. You can also attach the light with the included strap, but I couldn’t think of any good place to attach it while hiking or running. I tried attaching it to the shoulder straps of my Osprey Talon 44 backpack but since the shoulder straps are curved and the light is long and stiff, it didn’t fit together. Again, if you are doing another sport than hiking/running which requires more equipment (and thus attachment points), you might have better options for attaching the Kogalla RA in a practical and efficient manner. Note: The Kogalla team explained me that if the magnetic plate doesn’t stick to the light, you need to turn it around and try again – it has to do something with the magnet polarities. They also said they will explain better how to attach the light with the magnetic panel to their customers. This video explains how to attach the light with the strap. I guess it really depends on you gear how easy it is to attach it. The Kogalla RA comes with a 6700 mAh battery pack on which it runs for 3 hours at the highest brightness. The light is equipped with a USB cable (cannot be detached) which you can either connect to the battery pack, another power bank (as long as it has a USB plug), a computer etc. 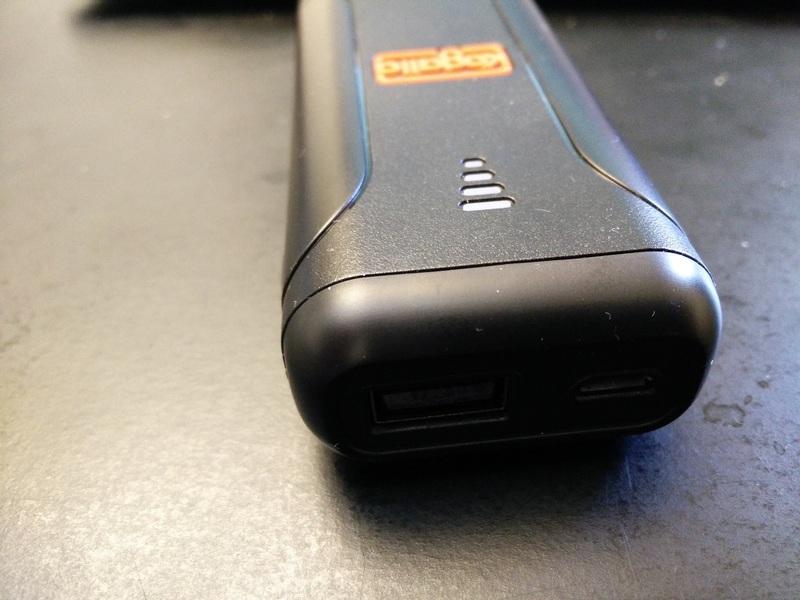 The battery pack can itself be charged with a micro USB cable (included). 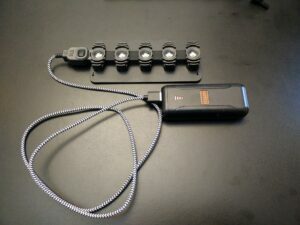 It also works as a power bank and thus you can charge various devices with it (smartphone, tablet etc.) The battery pack has a button – if you tap it once, it turns on and if you tap it twice, it turns off. It also automatically turns on if you connect it to a device. This feature is a bit buggy though; if the battery pack is on when you connect a device to it, it will turn off instead of staying on. You also won’t be able to turn it on by pressing the button. Instead you’ll have to first detach the device, then turn off the battery bank and then reconnect it to the device. The problem with the battery pack is that it is relatively heavy (150 g / 5.3 ounces) and therefore it bounces around when you are running. This is especially annoying if you are wearing light clothes – for example if you store it in the pocket of your shorts. Another inconvenient thing is the USB cable of the Kogalla RA. It is equipped with a nylon coating to prevent knotting and insure durability. However, the nylon coating makes the cable bulky and hard to fold. The light seems to be well-made and sturdy. However, I wouldn’t let it be exposed to heavy rain because I am quite sure that the battery pack is not waterproof. If you are planning to use the light in heavy rain, store the battery pack in the pocket of your rain jacket to keep it dry. The Kogalla RA Adventure Light provides good illumination and is as such easy to use. However, attaching the light is a hassle and the battery pack is too heavy (at least for running). Will I use the light? Sure, for walking, camping and everyday things but not for running or hiking. 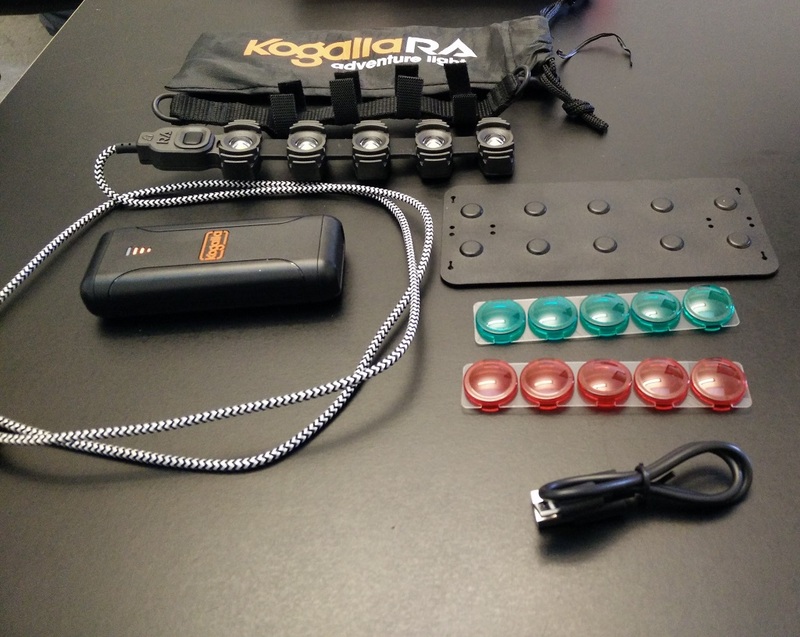 If you are considering buying the Kogalla RA light, you should first be certain of how you will use/attach it. I believe that there are sports for which it is very useful, but running is unfortunately not one of them. For running and hiking, I would still much rather use a headlamp. Check out our selection of the Best Headlamps here.